Seattle Business magazine's inaugural Daring Women event is being held Thursday, May 10. 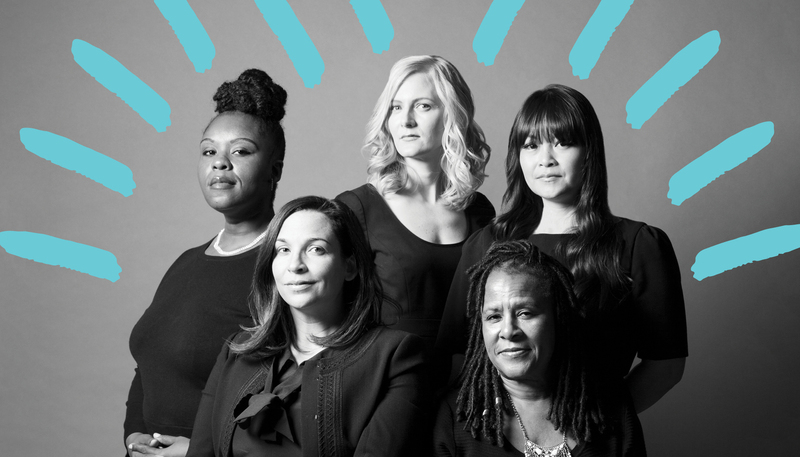 Click here for the full schedule of events, featuring some of the most fearless females in Seattle talking growth, innovation, inspiration and leadership. Is your company playing fair? Does it have a policy stating that women are respected and valued? Do we really need these safeguards in the 21st century? The #MeToo movement alone suggests the answer is yes. And there’s plenty more that businesses can do to assure an equitable workplace. MAKING IT HAPPEN: Clockwise from left: Caryn Mathes, Amy Nelson, Cheryl Ingram, Kim Vu and Christy Johnson at The Riveter, the coworking space Nelson cofounded on Capitol Hill. From mentoring to creating woman-friendly environments to advocating for change, each woman has intentionally affected the movement to assure gender balance. During her decade as litigator for a big law firm, Amy Nelson remained painfully aware that her workplaces were not always female friendly. Evidence abounded — from the office temperature set to please jacket-clad men to the upper-body strength required to open office doors. The final straw came when, anticipating her return from maternity leave, she asked for permission to install blinds in her office — at her own expense — so she could pump breast milk at her desk instead of walking 30 minutes to and from the firm’s designated breast-pumping room in another building. The firm denied her request. Nelson eventually won this skirmish on appeal, but the experience got her thinking. What could a workplace look like if women were considered in its design? While highly desirable, especially in this era of #MeToo and Time’s Up, female-friendly and gender-diverse workplaces don’t come easily. Easier, for sure, if, like Nelson, you can make your own rules. And easier for big companies when support for diversity and equality in hiring, pay and promotions comes from the top. TrueBlue Inc., Alaska Air Group and Starbucks stand among local companies leading the way. TrueBlue’s eight board members comprise three women and three persons of color; Alaska Air Group has four women on its 11-member board; and Starbucks’ 14-member board boasts one of the nation’s most diverse makeups: 29 percent female, 36 percent minority. Sadly, Colleen Brown describes achieving diverse boards as being “harder than it should be.” The former president and CEO of Fisher Communications serves on the boards of TrueBlue, the Port Blakely Companies and Delta Dental of Washington. She explains that boards generally recruit new members from their own networks, and their members, predominantly white men, just don’t know enough qualified women and people of color. That imbalance, Brown tells them, can be corrected by considering candidates who have been CEOs of smaller-than-Fortune-1000 businesses and by looking at female and minority execs who have held CMO, CRO and CHRO positions. “Just make a plan and work it,” Brown asserts. No excuses. Clearly, the evolution of diverse boards of directors will take some time. While that pot simmers, it’s encouraging to know that gender equality and pay parity have been on the front burner since 2014 at the Seattle Metropolitan Chamber of Commerce and the Women’s Funding Alliance (WFA), a Seattle organization dedicated to advancing leadership and economic opportunity for women and girls. U.S. Senator Patty Murray got that ball rolling in 2013 by lighting a fire under the chamber’s then-CEO, Maud Daudon. Figures had just been released about the humiliatingly high gender pay gap in King County and Murray asked Daudon what she intended to do about it. A roundtable of women swiftly convened and two courses of action emerged. First came the chamber’s Women in Business Leadership Initiative (WIBLI), which, since its 2014 launch, has brought together 2,600 businesswomen at symposiums and programs where they find a safe place to get together, learn from each other, do a little mentoring, get a little training and be inspired. In 2015, the chamber and WFA partnered on the second effort, named 100% Talent, to tackle and improve the gender pay gap and gender equity in the workplace. It counts among its accomplishments 70 “signatory” employers whose work has helped shrink the gender pay gap in King County by 3 percentage points. When the program started, women working full time in King County earned 75.8 cents for every dollar earned by a man. By 2017 (using 2015 data released by the federal government), the gap had shrunk to 78.6 percent. Progress, to be sure. But the gap still gapes. There are more rays of sunshine. Zillow Group, one of 100% Talent’s signatories, considers itself a proud overachiever. COO Amy Bohutinsky says Zillow conducts rigorous gender compensation testing every year to ensure that women and men receive equal compensation. Its latest evaluation shows that “on average, women at our company earn $1.01 for every dollar a man makes in a comparable role,” Bohutinsky reports. Ta-da! The point, of course, is not that women should be making more than men for doing the same work, though one could argue that women certainly deserve it to make up for decades of pay inequity. The one-penny differential at Zillow simply means men and women have finally reached parity within a reasonable margin of error. The efforts of 100% Talent helped produce a list of 27 best practices, which companies can use to guide their journeys toward gender parity. Twenty-seven seems like a lot, admits WFA’s CEO, Liz Vivian. But not all 27 apply to every business. Equal pay for men and women doing the same jobs is, of course, paramount when it comes to creating and maintaining a female-friendly workplace. And right up there on the priority list is a workplace that will not tolerate harassment, sexual or otherwise. That understanding calls for a policy. That policy, says Valerie Hughes, a partner at the Seattle law firm Perkins Coie, should come from the top and set the tone that women are respected and valued in the workplace. It should be in writing, should describe the procedure for reporting a complaint, and include a commitment to a prompt, thorough and impartial investigation and to acting if evidence warrants. The policy should be posted and distributed at least once a year, with some in-person training every couple of years. It’s important, Hughes adds, that the process offer more than one place to file a complaint — as in going to HR, to a specific named individual or to a supervisor. After all, nobody will file a complaint with her boss if the boss is the one causing the problem. Making it comfortable for an employee to file a complaint helps ensure that she won’t remain silent. Some companies are even moving toward employee hotlines where complaints can be made anonymously. Alaska Airlines goes so far as to print a hotline number on every employee badge for use in reporting incidents that occur at work. Ok. You have a position and a policy. How do you know if you need to do more? Do some research, say the experts. For example, Cheryl Ingram, founder of Diverse City, which consults with businesses on how to become more diverse, equitable and inclusive, cautions that training is not enough. Of course, self-reflection can be difficult if a company has bad record keeping. Ingram says 90 percent of businesses don’t keep good data on hiring and inclusion, that is, promotions, terminations, recruitment (where do résumés come from? ), etc. So, she has created a new startup called Inclusology, whose software platform will help mine that data. Before you envision endless interviews, focus groups, spreadsheets and stupefying navel gazing, consultant Christy Johnson, CEO of Mukilteo-based Artemis Connection, insists that research doesn’t have to be scary. If you’re a big company, you can look at the data you already have: How diverse is your hiring? Where are you recruiting? Who are you promoting? What’s your retention rate for women and minorities? Afraid to look? Johnson knows what to do. Employee surveys offer one way to get a snapshot of how women at work are feeling. Johnson favors ones that compare women’s experiences and men’s perspectives of those experiences. Disparate results make for a good discussion. Discussion. Sure. Why not talk? Smaller, data-light companies may especially prefer a candid conversation with female staff about how they rate their employer’s female-friendliness. It’s what CEO Betti Fujikado did earlier this year at Copacino + Fujikado, the Seattle ad agency she cofounded 20 years ago. 1) Why did you come to the meeting? 2) What do you view as the issues? 3) What can C+F do for you? - Respect and recognition for their work. - Professional development into leadership roles. - Employee benefits that respect/encourage lifestyle choices, such as maternity and caregiving needs. - Consideration for women’s perspective in client work. Whatever the fact-gathering method, Johnson recommends using the results to come up with a plan, build a strategy and hold people accountable. It’s likely the results will identify a need for training. Training can range from low-impact online modules for large audiences to interactive group sessions to one-on-one training for individuals whose behavior merits remedial action. And don’t forget training for managers. They’re the ones responsible for carrying leadership’s values into the field. Women assigned to better bosses enjoy more success and are less likely to look for greener pastures. Well-schooled in ROI, Johnson advises that if you’re going to invest in training, you should establish criteria to measure it against. For example, conduct training that’s intended to increase employee engagement, increase productivity or decrease recruiting costs. Then measure the results. Training sometimes just isn’t enough. Seven years ago, Johnson’s star client, Zynga Inc., had, well, a horrible culture. The San Francisco-based creator of the online game Words with Friends asked for help when it couldn’t stem the exodus of female employees. These departures posed a big problem, because without women, Zynga couldn’t produce the games that appealed to its primary customers — women! The company committed to an action plan that added women to leadership positions and created female-friendly programs like W@Z (Women at Zynga). Things have improved. Johnson says Zynga is recruiting, developing and retaining women in key development and creative roles. The company is more competitive, but the game’s not over and the work goes on. For the men out there willing to be allies but not exactly sure how to proceed, Greatheart Consulting CEO Chuck Shelton has one word: decentering. - Stepping out of the spotlight in presentations to position a woman to speak. - Organizing projects so female colleagues can lead and gain credit. - Delegating responsibility to women and providing the support they need. - Engaging in reciprocal mentoring to learn from female direct reports. - Deferring decision making to female peers. - Helping women superiors succeed. - Paying attention to the ways women disagree with one another. - Building accountable relationships of trust with women. When it comes to enhancing a female-friendly workplace, there’s no cookbook. But businesses can add to the soup some small ingredients that taste good to everyone. Johnson recommends trying something new and sharing your success. FAMILY FIRST. Pam Yanchik Connealy, global head of talent for the Bill & Melinda Gates Foundation, describes the foundation's decision to offer a full year of paid parental leave as "the jewel in our crown." Seattle-based companies are doing just that. Oh, right. It’s the Gates Foundation. But a for-profit corporation like Netflix is doing it, too! Meanwhile, in the business of making art, Seattle’s Pratt Fine Arts Center is testing an idea on a smaller scale. Among the many specialties at its community arts education center, Pratt teaches glassmaking. But most of its young female glass students will not pursue careers in glass because the field is famously male dominated. Multimedia artist and Pratt Master Member Amy Helen Johnson came up with an idea and has invested $5,000 annually for the next five years to improve on that imbalance. Her Theresa Jane Teen Scholarship will pay for classes and professional mentorships for five female high school students who want to pursue art degrees with a concentration in glass. Their mentors, all Pratt teachers, will help the girls assemble portfolios of work that should lead to acceptance into college art programs. Additions were made to the online version of this story after its initial publication.